It’s Friday the 13th or Lucky Black Cat Day. Update: the original post did not appear on our website. Our tech support created a new draft and paws crossed that it works! Did you blink? Think it’s a joke? Friday the 13th is so mired in superstition about black cats, why not do a 180 and turn black to white, a negative to a positive? Most people don’t even know the origins surrounding the number 13 anyway. Some think it stems from the betrayal of Judas the 13th disciple of Jesus but long before Christianity, Norse mythology had a similar dinner guest, the Norse god Loki. If you want to explore the negative and positive qualities of the number, enjoy 13 is also a mystical and magical number in mythology, the occult, mysteries and ancient history. We’re so passionate about getting more black cats adopted we’re doing a Kickstarter for Black Cats Tell All: 22 Amazing True Tales. 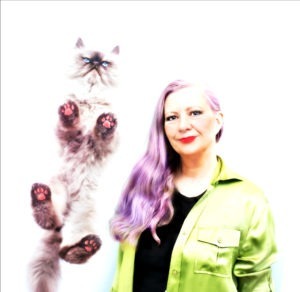 The anthology of 22 famous and not so famous but fabulous black cats telling positive stories has never been done before. The Kickstarter launch date is May 26 and we’ll need a bit of luck from you to get our non-profit project funded. The perks for even small pledges will be special. If you want to be kept in the loop about the book (and yes, we left a few spots open for submissions.) be sure to subscribe via email to Cat Wisdom101. If you’ve requested the submission guidelines and your cat is writing a story, tell them to stop catnapping and get their furry behind to work. 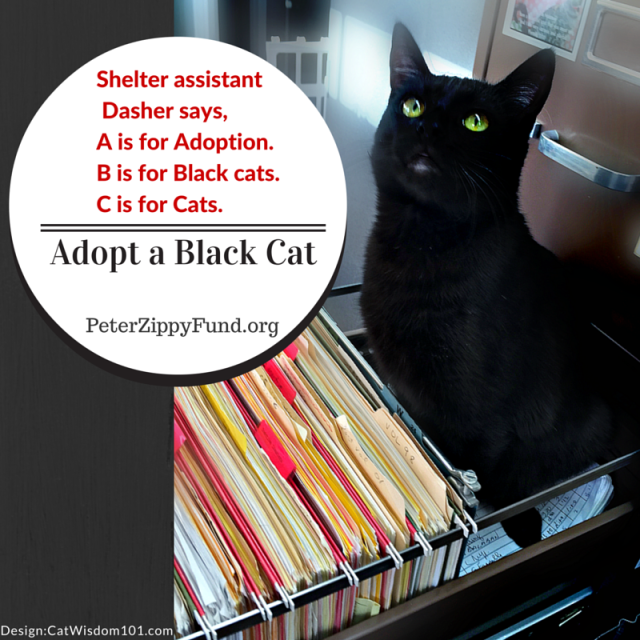 We expect the book to be published in time for Black Cat Appreciation Month (October). It’s Friday so it’s also our favorite vintage black cat finds. How fabulous is this short story magazine cover for May? May 1896 that is. I collect vintage teapots or at least I used to before veterinary bills and hospice care ate up my lunch money. 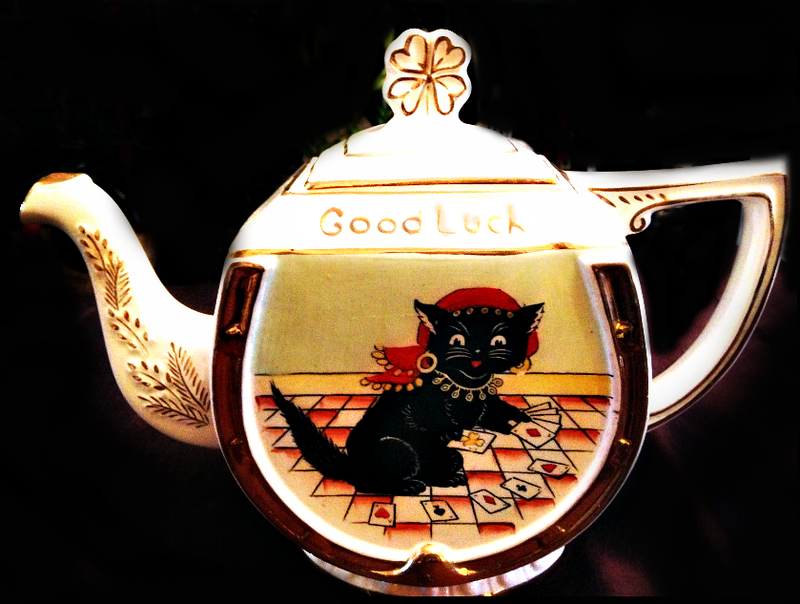 There is one teapot I’m still salivating over but missed bidding on an Ebay auction. It’s going on my wishlist. Any day could be lucky black cat day. Imagine pouring the tea, good to the last lucky drop, into lucky black cat mugs? These beauties are mid-century Shafford red-ware The company made all kinds houseware items from salt and pepper shakers to ashtrays. We’re going to have something even better as one of our Kickstarter perks. 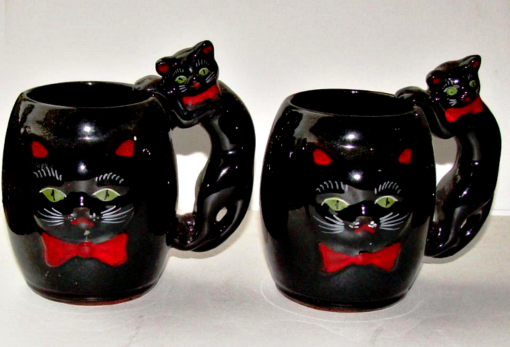 Crazy Cat Lady Ceramics is making us an exclusive, limited edition lucky black cat mug. And her sleek, house panther Shalom is cooking up a story more tall than true. How could he not living with cats named Baby Jesus, Monkey, Bull Bull and Push Push the gourmand? Check them out on Facebook. 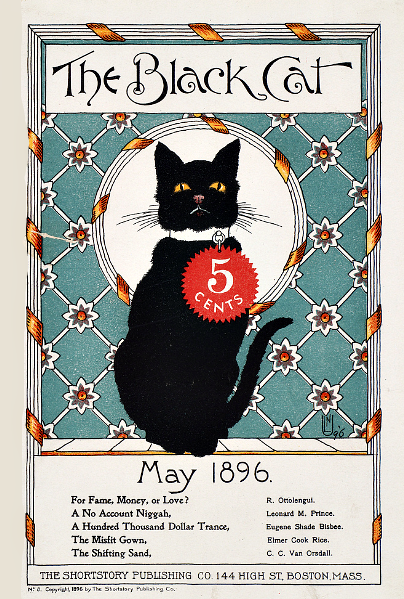 HAPPY FRIDAY THE 13th and Lucky BLACK CAT DAY! An impressive share! I’ve just forwarded this onto a co-worker who has been doing a little homework on this. And he actually ordered me breakfast because I stumbled upon it for him… lol. So let me reword this…. Thank YOU for the meal!! But yeah, thanks for spending the time to discuss this issue here on your web site.